Fountain Paint Pot is one of many mudpots found in the park. In early summer the mudpots are thin and watery from abundant rain and snow. By late summer they are quite thick. The mud is composed of clay minerals and fine particles of silica. In this area the rock is rhyolite, which is composed primarily of quartz and feldspar. 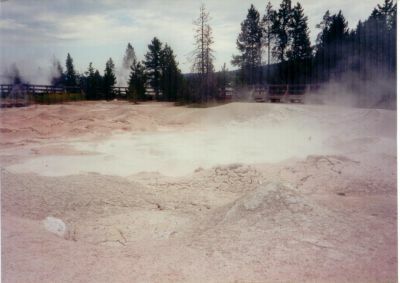 Acids in the steam and water break down the feldspar into a clay mineral called kaolinite.